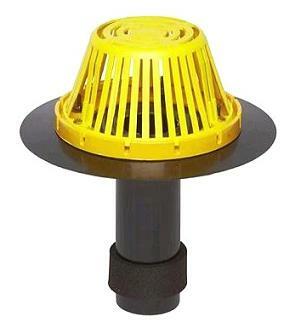 CONSTRUCTION: Drains set consists of a molded ultraviolet stabilized polyethylene drain dome, a cast aluminum epoxy coated gravel guard and clamping ring, 14" O.D. injection molded ultraviolet stabilized black ABS drain flange with top rib flashing lock. The ABS downspout outlet pipe is 10" long and has a pre-compressed modified asphalt impregnated expanding foam, sealing tape, having a temperature range of -40 F to +185 F and 150% minimum elongation.